The following code snippet is an example how to design a half band filter. Half band filters are interesting because every even coefficient, except 0, is 0. Those multiplications do not need to be performed, additional calculation reduction can be gained by implementing a folded FIR (coeffecients are symmetric). Only 1/4 the multiplies are required for a straight-forward implementation. Also, polyphase implementations  reduce the required number of multiplications even further. 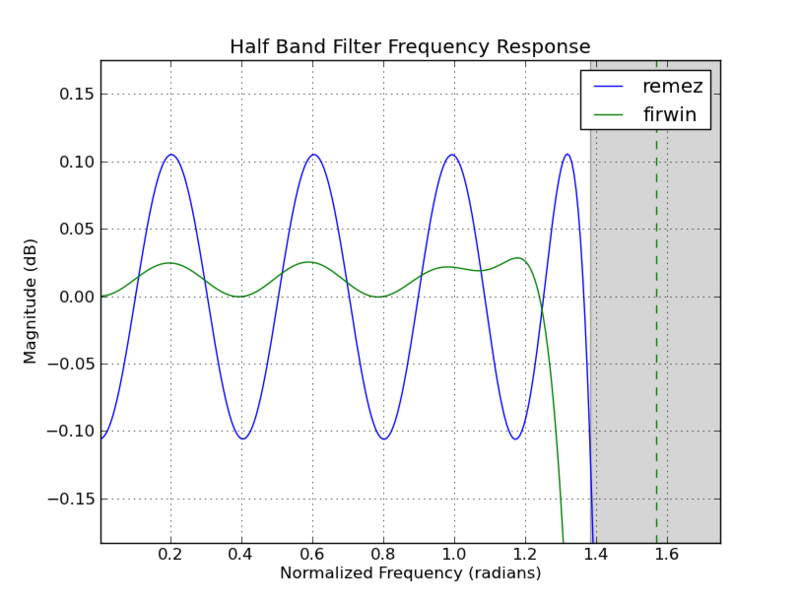 This code snippet is an example how to design a half band filter using the remez function in the Python scipy.signal package. 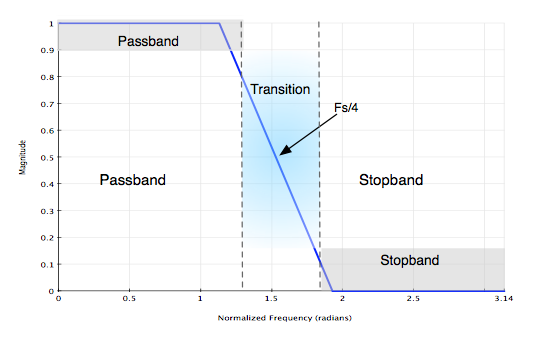 A half band filter can be designed using the Parks-McCellen equilripple design methods by having equal offsets of the pass-band and stop-band (from filter specification) and equal weights of the pass-band and stop-band . The code snippet below is an iPython session. The numpy/scipy packages are required. 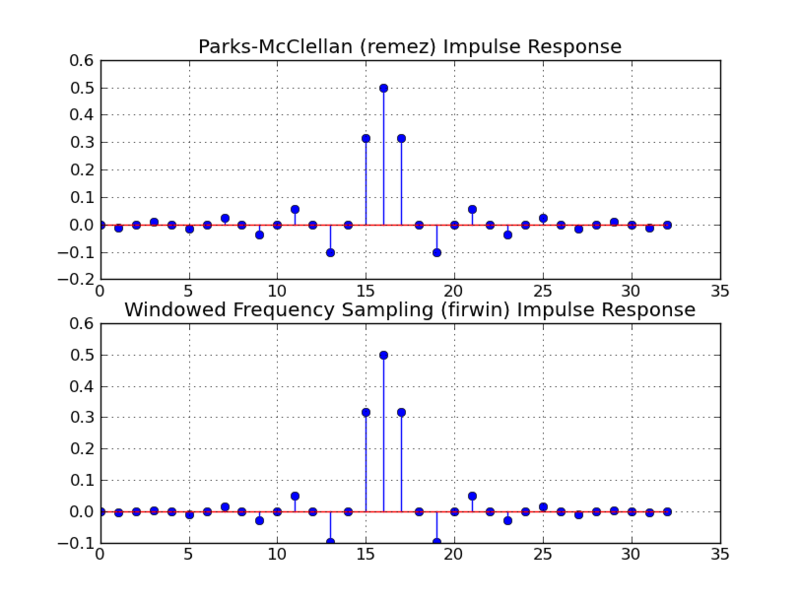 The "remez" function is part of the scipy.signal package. The following plot is generated from the code snippet output and shows the filter response, in dB, for the filter length in the example. 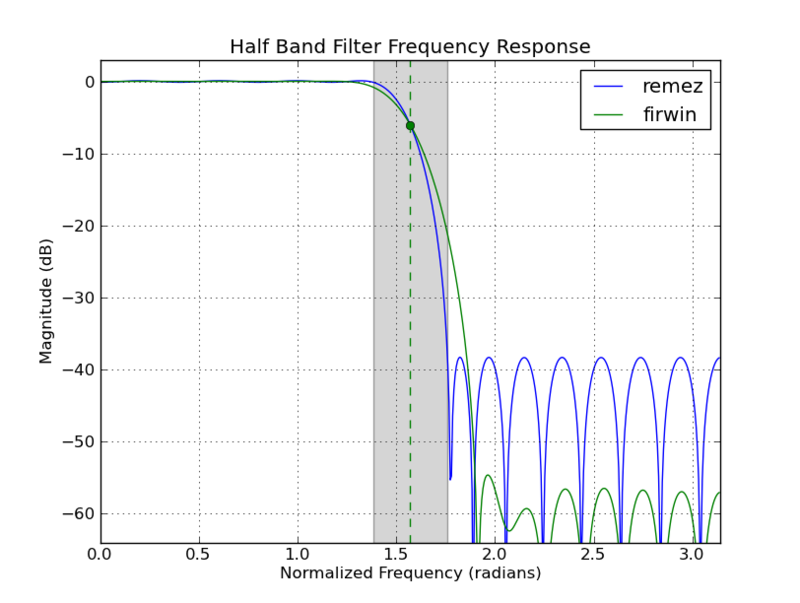 A commentor, @kaz, pointed out that the firwin design produces lower attenuation in the stopband and less ripple in the passband. But the firwin design has a slower transition band. In multi-rate systems which use the halfband filter and decimate by 2 more signal beyond Fs/4 will be aliased. This is a consideration for the designer. The windowed frequency sampling design (scipy.signal firwin, Matlab fir1) produces the same strucutre, every other coefficient 0 so it can be used in an optimized implementation. Every other coeffecient is zero as expected. McClellan, Parks, "A Personal History of the Parks-McClellan Algorithm", IEEE Signal Processing Magazine 2005. @kaz Thanks for the comment and the additional input of the windowed frequency sampling design method results. I have updated the code snippet. Note, the fir1 design produces a slower transition so this design method might not be as desirable in multi-rate systems because more signal will be aliased beyond the Fs/4 point. This is a design trade-off that needs to be weighed, additional stopband attenuation vs slower transition. Thanks, I will get the code updated ASAP.